How much will be a return on investment on my property? Not only investors have this questions in mind before purchasing a property. A first time buyer also should be expecting something in return: Does the property is safe that my family could enjoy with? Personal satisfaction is a kind of intangible return that need to consider as something tangible. Many people had transferred location from their house to another house because there is dissatisfaction or might be other considerations. But most of them upgraded their lifestyle and are looking for better place for their family. Return of Investment (ROI) is used to evaluate the efficiency of an investment or to compare the efficiency of a number of different investments or options. 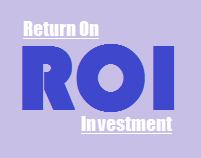 To calculate ROI, the benefit (return) of an investment is divided by the cost of the investment; the result is expressed as a percentage or a ratio (definition from investopedia.com). Below is an illustration to show the use of Return of Investment Ratio. 1. You purchase a Condo property in Alabang Muntinlupa City Philippines, Studio Unit 24 sqm for Php. 1,600,000. You have enough money to pay it in cash though you are considering a financing option. You are planning the property for rental business. The question is what payment option will give you the best return on investment? 2. Before you proceed with the purchase of property, you have to consider the following. Above shows a Return on Investment (ROI) of 10.3% if you paid the property in cash of Php. 1,600,000.00 higher than 8.97% if you opted for Bank Financing at 80% Loanble Amount. Although, all variables actually varies on countries and cities, tax and interest rates, here in the Philippines we have up to 20 years term on Bank Financing. For some economic projects which allows to avail up to 90% Loanable Amount at bank and in 20-year term would enjoy a higher rate of investment than paying Outright Spot Cash, a sample computation below. With the above samples, the longer the term the higher the return and of course the higher the risk on your investment. How is the risk a higher compare to short term payment? Imagine your are paying up to 20 years and need to payout an annual expense of Php. 131,960 and consider there are time of stagnant, non-payment of renters, and an increase in expenses in rental business. Hello Sir Good day, my name is amado angelo a. barrientos. I have read your ROI discussions. I am currently doing local and foreign research about ROI. This is my research paper for my masters degree requirement. I'd like to ask your permission to use your method of ROI calculation as one of my reference. I will present the whole methodology of ROI. I am also planning to do this as my dissertation for my doctorate soon. I hope. So may I use your method of calculation with your name as the author. thank you so much sir Jerome.